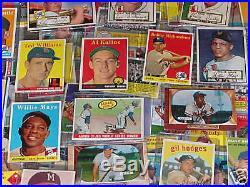 Huge Collection of Vintage Baseball Cards!!! Every Card over 25 Years Old!!! Of course, remember, that 100% of all final proceeds go to charity. Each lot includes 100 Vintage Cards. Each lot includes 25 cards from the 1950s, 25 cards from the 1960s, 25 cards from the 1970s, and 25 cards from the early 1980s. Each lot will include a Vintage Mickey Mantle Comic Book. Each lot will include a Jackie Robinson Commemorative Coin. Each lot will include at least one BOWMAN card from the 1940s or 1950s. Each lot will include at least one 1952 topps card. Each lot will include at least one Vintage Autographed Card. Remember the proceeds go to Charity!!!! And please ENJOY this GREAT collection!!!!! Please feel free to ask us any questions that you may have. Thanks again and God Bless!!! And Thanks again for supporting this GREAT cause!!! PLEASE CHECK OUR OTHER GREAT NON-PROFIT AUCTIONS!!!!!!!!! Thank you and God Bless. The item "100 VINTAGE BASEBALL CARDS withMickey Mantle Item" is in sale since Sunday, August 02, 2009. This item is in the category "Sports Mem, Cards & Fan Shop\Sports Trading Cards\Baseball Cards". The seller is "helpinghumans" and is located in New York, New York. This item can be shipped to United States, Canada, United Kingdom, China, Mexico, Germany, Japan, Brazil, France, Australia, Russian federation, Denmark, Romania, Slovakia, Bulgaria, Czech republic, Finland, Hungary, Latvia, Lithuania, Malta, Estonia, Greece, Portugal, Cyprus, Slovenia, Sweden, South Korea, Indonesia, Taiwan, South africa, Thailand, Belgium, Hong Kong, Ireland, Netherlands, Poland, Spain, Italy, Austria, Israel, New Zealand, Philippines, Singapore, Switzerland, Norway, Saudi arabia, United arab emirates, Qatar, Kuwait, Bahrain, Croatia, Malaysia, Chile, Colombia, Costa rica, Dominican republic, Panama, Trinidad and tobago, Guatemala, El salvador, Honduras, Jamaica, Antigua and barbuda, Aruba, Belize, Dominica, Grenada, Saint kitts and nevis, Saint lucia, Montserrat, Turks and caicos islands, Barbados, Bangladesh, Bermuda, Brunei darussalam, Bolivia, Ecuador, Egypt, French guiana, Guernsey, Gibraltar, Guadeloupe, Iceland, Jersey, Jordan, Cambodia, Cayman islands, Liechtenstein, Sri lanka, Luxembourg, Monaco, Macao, Martinique, Maldives, Nicaragua, Oman, Peru, Pakistan, Paraguay, Reunion.